MOSCOW (UrduPoint News / Sputnik - 16th April, 2019) The headlines of major French papers on Tuesday morning expressed the profound grief of the entire French nation, with virtually every media outlet placing images of a fierce fire that started a day before and caused irreparable damage to one of the main symbols of Paris and France the Notre Dame cathedral on their front pages. 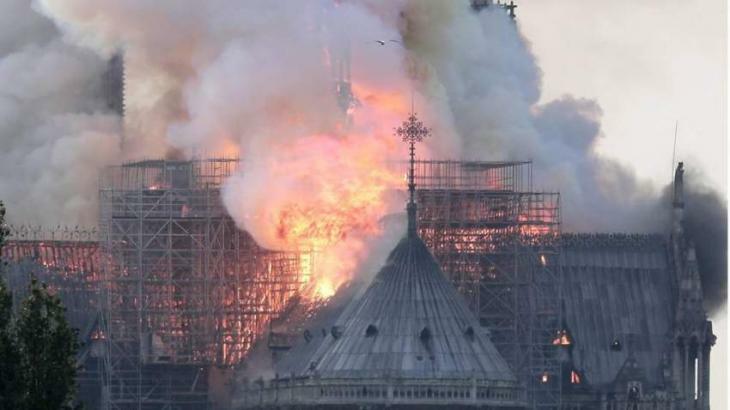 A spokesman for the cathedral, Andre Finot, noted that the restoration works were primarily focused on the spire, which was destroyed by the fire. According to Finot, by the time the fire started � about 6:50 p.m. local time (16:50 GMT) � the workers should have already left the cathedral, as they usually finish their shift no later than 6:30 p.m., but thus far no one can tell if the restorers were in the building when the blaze started.